When people want to have more engagement in the teams, they typically think about ‘culture’ and ‘mindset’. They would like to see more positivity and enthusiasm in the teams. Or they consider colleagues should take more initiative. Or they want to see more ‘team spirit’ (instead of ‘silo-thinking’ or individualism). In our opinion, most of the time it is insufficient to only work on ‘culture’ and ‘mindset’. 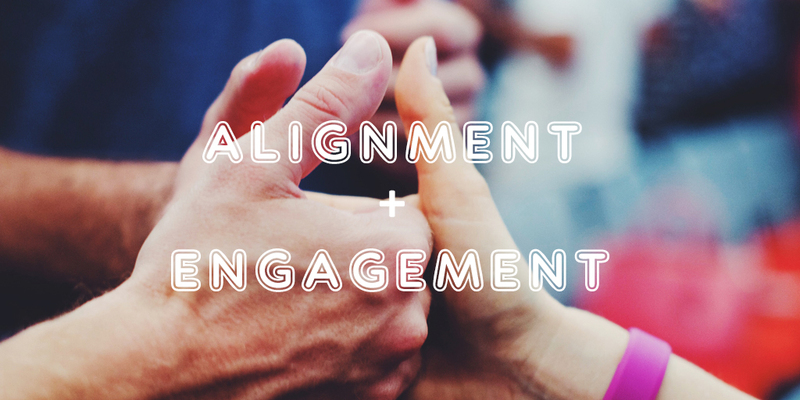 For us, if you want to create engagement, there are 3 pillars to pay attention to. When searching the root causes of ‘disengagement’ or of ‘silo-thinking’ in organizations, we keep hearing the same: people tell they are not clear on the direction the organization is going in. They say there’s no compelling vision. Or no vision at all. In reality, often there IS a vision, but people are insufficiently aware of it. Or they are worried it’s the ‘wrong’ vision, and the company is heading the wrong way. This lack of business alignment often leads to disengagement. Which brings us to the first pillar of engagement: making sure there is a shared, compelling vision. (read more about the key success factors in our previous post). Business alignment is not sufficient though. When people have the impression their opinion doesn’t matter, their engagement disappears. When they hear constant criticism, their enthusiasm vanishes. When rivalries remain unaddressed, silo-thinking continues to linger on. That’s where the need for people alignment comes in. Effective collaboration is crucial for teams to feel engaged. Make sure to deal with the underlying tensions in the team, address the elephants in the room and create a ‘true team’. Where people work together in a positive and open spirit. Where they value and trust each other. Where they bring the best out of each other. Often, when executive committees have developed their ‘shared vision’ and their ‘collaboration principles’, they are euphoric. There’s renewed hope. There’s a lot of commitment. But this commitment doesn’t last if the vision and collaboration principles are ‘insufficiently put into practice’. That’s why it’s so important to pay attention to the sustained alignment. The example needs to come from the top. But it should also be cascaded throughout the organization. In a positive and collaborative spirit. Where all layers of the organization know where the company is going and how it intends to get there. Where everybody understands how they can contribute. Where all feel encouraged to give their best so as to get closer to the vision. Pay insufficient attention to any of these pillars, and you will notice disengagement increase…Effectively address all three pillars, and you will see engagement rise. Contact us if you want our guidance to help you or your team te be more aligned & engaged.